For years, swamps and marshes have been viewed as mucky, mosquito ridden wastelands which could only become useful or beautiful after being filled in or drained. This tragic misconception has led to the second most productive ecosystem on our planet (second only to coral reefs) being reduced by 60% compared to what was available only a century ago. And along with this radical habitat loss has come a drastic decline in the numbers and species of birds, frogs, reptiles, insects, and other creatures that call the wetlands home. But even as wetlands disappear before our eyes scientists continue to discover ways in which our wetlands are beneficial, even vital. For starters wetlands purify our air and water, they provide important nesting and feeding grounds for migratory birds, they support more than a third of America�s endangered species, and they are a major asset in buffering our cities and neighborhoods against hurricanes and floods. But what is a wetland? "Wetland" is a broad term for any flat, spongy, water-saturated, semi-terrestrial environment. The land mixes with the water. And the water mixes with the land. 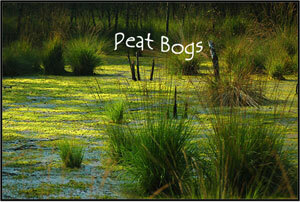 Wetlands are characterized by distinctive plant and animal species. 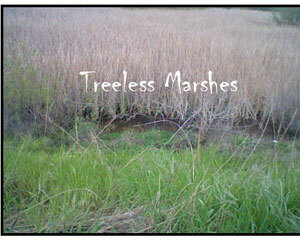 Wetlands can be tidal or non-tidal and can hold fresh, salt, or even brackish water. Some wetlands stay wet all year and others experience prolonged dry periods. And in fact some portions of a wetlands environment may be dry for many years, only to be completely transformed into a wet, marshy wonderland for frogs, ducks, and long legged herons during a year of exceptionally heavy rain. Because wetlands occur in so many different parts of the world and vary greatly, there are many different words used to describe them, even within the English language. 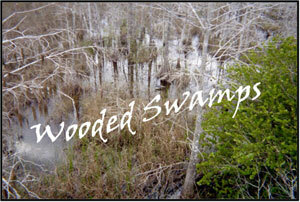 Some you may have heard are: slough, swamp, bayou, bog, estuary, fen, and vernal pond. Although wetlands come in different types and are called by many names, they all fill a critical role in providing homes as well as breeding & feeding locations for wildlife, for regulating climate and flood patterns, and for supporting a healthy ecology in the other biomes that interconnect with them. But even as we are learning about the delicate nature of wetlands and their important ecological role, we are discovering how important wetlands are to us emotionally, aesthetically, and educationally. Wetlands provide a sensory rich natural environment that reconnects us with the awe and wonder so uplifting to the human spirit. A value once championed by our great writers like Emerson, Thoreau and naturalist John Muir, this spiritual and psychological renewal is now being verified by modern science! Time spent in nature has been clinically shown to reduce depression and irritability and to improve health and mental focus, for both children and adults. And in many communities wetlands are one of the few places one can find wide open spaces, a naturalistic landscape, and abundant wildlife. Many communities are also dotted with micro-wetlands -- small pockets of nature within a larger urban environment -- that provide ready access to small but powerful doses of nature. to support them. Spend time there. Volunteer there. And bring friends and children there and help them fall in love with wetlands. [Read What You Can Do to Help Wildlife & Plants.]. Below you'll find resources that you can use to educate yourself and others about caring for and enjoying wetlands and the creatures that live there. We've also included plenty of fascinating fact sources about different wetlands habitats and the birds, reptiles, amphibians, mammals, fish, and insects that live there. You'll also find book ideas as well as craft and activity resources for younger children. If you have a favorite resource that you'd like to see included, please let us know. You don't conserve what you don't care about." -- Robert Michael Pyle, author and naturalist. In 1995 a group of school kids and their teacher noticed a high incidence of malformed frogs in an area of Minnesota and decided they wanted answers! What followed was a collaboration between kids, scientists, and other community members to survey the scope of the situation and find the source of the problem. There are many ways in which you too can be an advocate for frogs and other wetlands wildlife, including migratory birds. Don't hesitate to report injured or malformed creatures to local wildlife officials. Remember too that human activities that may harm wildlife preserves or our rivers, bays, and oceans or other water ways may also require reporting. Such activities include the illegal dumping of garbage, pesticides, and household chemicals. And of course, remind your family and school to cut down on the use of harmful cleaners, chemical fertilizers and pesticides -- and to dispose of them properly when necessary. Also, because amphibians like frogs need a pollution free habitat to live and breed, consider volunteering your time caring for a local pond or wetlands area. Your family or school group can clean up trash and monitor the health of your adopted biome. Just be sure to check with local officials if this is on public land or to get permission from the owner/resident if it is on private land. And of course, because habitat loss is an important reason frogs are disappearing from our communities, you can help frogs and other wildlife by making your backyard or school wildlife friendly! 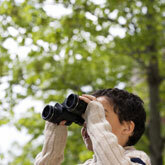 Learn how to create a backyard habitat from the National Wildlife Foundation. Participate in a local bioblitz. A bioblitz is where kids, scientists, and other community members work together to count and record the number and diversity of animals species. A bioblitz is a useful way to monitor the health and viability of a local biome. Contact the staff at your local wildlife preserve or department of fish & wildlife to find out when and where the next bioblitz takes place. Or just google "bioblitz" and the name of your community. Watch this video from PBS to see how some kids went on their own mini bioblitz to learn more about the creatures in their local wetlands. Using knowledge to take action - big or small - can be empowering and a very beneficial learning experience. This publication from Ducks Unlimited provides inspiring examples and step-by-step ideas onactivities you might undertake from beginner to advanced level. How To Deliver a Wetland Field Trip. 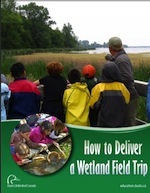 Excellent guide for teachers and homeschooling parents taking older kids on a wetlands science excursion. This printable lesson guide highlights the important role wetlands play around the globe. Wetlands and the World provides ways for exploring wetlands across cultures and for recognizing the value of wetlands in maintaining a healthy world for all of us. Linked to the elementary school curriculum across Canada in grades 1-8. You can use an empty coffee can or large size plastic yogurt container to create this classic tool for outdoor pond or creek exploration. Cut the end off the container (use a can opener on the metal coffee can). If you wish, cover the rough ends where cut with duct tape. You now have a waterproof tube. Next, cover one end of the tube with sturdy plastic and fix it in place with a large rubber band, such as the one that binds your Sunday newspaper. If you don't take the paper, ask a neighbor for one or pick some up at the craft store. 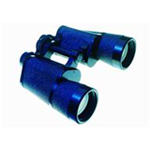 A piece of thin elastic may also be used. 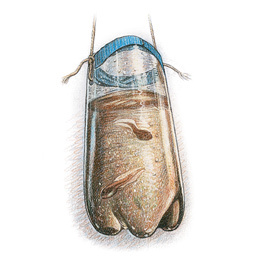 To use your viewer, place the plastic covered end into the water and submerge the viewer part way. As the water presses on the plastic it's shape changes from flat to concave, creating natural magnification. Save those small clear containers that your salads come in from the deli department and reuse them as portable viewing tanks. These are wonderful for dipping in ponds, creeks, and tide pools -- and for keeping small water creatures in for temporary viewing. Small fish, tadpoles, crabs, and crayfish are wonderful to observe up close. And a clear container affords a view from all sides of your small guest! Another great clear portable viewing container can be made from an empty soda pop bottle. See directions for this observation bucket from Family Fun. NOTE: Always treat the creatures you capture gently, and always put them back where you found them before you leave their habitat. This keeps them safe, makes sure there will be plenty for future visitors to the habitat to see, and it practices the important values of compassion and good stewardship. Models give children a hands-on substitute for the wild animals they long to hold and bring home. They also serve as a concrete visual reminder of a trip to the wetlands, a story book shared with the class, or an animal visitor to the classroom. 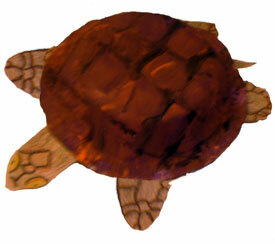 Here's a a fun project that allows children to make their own box turtle. Be sure to look at real turtles, or at least pictures, so that children can see how these funny fellows carry their homes about on their back. Talk about what turtles do when frightened -- they pop their heads and limbs back inside! Be sure to also discuss how the turtle's humble colors and variegated pattern help to camouflage them on land and in the water. Our box turtle craft uses two paper bowls, painted with tempra or acrylic paints. Paint is applied to the rounded backside/underside of the bowls. Let children explore color mixing with either purple and orange paint or with green and orange paint to make brown. A dash of black adds definition to lines. Paint the "shell" halves first and let dry. Meanwhile, print out these handouts with the head, tail, and feet. Children can color these with colored pencil, crayon, or even watercolor paints and then cut them out. Finished pieces may be attached to the underside of the dried top shell with tape, staples, glue, or hot glue. Lastly, attach the shell halves together with staples or hot glue. TIP: If you need to speed up the drying process, use an old hair dryer to blow dry the shells. Don't worry if the "shells" crimp around the edges while drying. This give them a more authentic look. Art projects help children process and express what they've seen and heard during lessons and field trips. And ducks are a favorite wetlands animal because they are all at once beautiful, comical, cute-n-cuddly, and often easier to spot than many denizens of the pond or marsh. 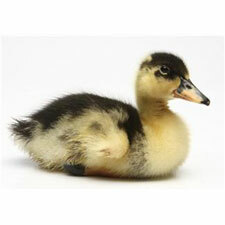 This link offers an assortment of duck related crafts for preschoolers and young elementary school children. A little complicated, but fun for older elementary school students and up. Why not glue on some fun googly eyes when you are done? Ribbit! It was something like a frog, but it didn't hop- it crawled. If someone asked you to name the creatures that usually live in a pond you would probably list ducks, frogs, turtles, dragonflies and other small animals, birds, and insects. But in a pond big things eat little things, and some of the littlest things of all can only be seen with a microscope! For a preview of what you might see if you collect some pond water and look at it with a microscope, check out Ron's Pond Scum and browse the links to see his microscopic collection. If you plan to do your own microscope investigations, be sure to check out this handy chart that classifies the different types of things you may find. Includes links to helpful overview guides that will help you identify your finds. Young children can drag and drop plants and animals to create a pond scene. Talk about the roles each one plays. Who might perch in that tree? Who makes a nest in the rushes? Who is found in the air, the water, on the shore, in the depths or on the surface of the pond? Why? Now get out there and visit a real pond and see who you can spot! Hint: don't forget to look for tracks, scats, and other signs of pond visitors. Who eats what at the pond? Preschoolers and kindergartners will enjoy browsing this free online "who dunnit" style book that illustrates a food chain. All pictures provided by kids! How people use the land can help or harm living things in an ecosystem. In this game the citizens of a nearby town want to develop a park in the area that surrounds their local pond. But how will changes to the land affect the fish in the pond? Changing the land that surrounds a pond ecosystem can either help or harm the fish living in the pond. In this virtual lab game provided by Discovery Education. you will be an environmental scientist who experiments to find the most eco-friendly way for the citizens to build their park. Think all wetlands are the same? Get the quick low down definition on what makes a swamp, a bog, a fen, or a marsh. While you're visiting this Untamed Science Biomes page, check out their map showing the distribution of wetlands in North America and check out their ideas for helping wetlands. Coastal wetlands, inland wetlands, saline marshes, wet prairies -- what do they have in common and what makes them each so special? 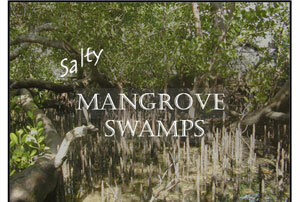 Useful information for anyone doing a report on wetlands. From the Environmental Protection Agency. Even more wetland varieties, thoughts on how swamps form, plus some very famous examples. From Nature Works. This kid friendly page from Ranger Rick is loaded with fun facts about the American alligator. Part of the Bio Kids Critter Catalog, this page is chock full of fascinating facts about the American alligator. Be sure to surf their excellent collection of photos. Great for reports. Learn about the difference between frogs and toads, meet some really strange and wacky frog species, and find out all about the life cycle and adaptations of different frog types. Part of the great Frog Land site with lots of cool frog photos. Learn about the insides of a frog without actually dissecting one. Great for middle school and high school students. Play the echolocation game, try some fun crosswords and word searches, and do some puzzles -- you're just getting started with this fun site that's all about bats. Michael J. Rosen. Illustrated by Tom Leonard. Giving the reader a dramatic, pond-dweller's-eye view, Rosen and Leonard memorably depict a freshwater ecology. On each spread, a lush, fluidly composed acrylic painting places the reader at the sight line of a different representative of pond life--snail, bat, ant, dragonfly, snapping turtle, mallard and so forth (12 in all). Rosen, meanwhile, relays each creature's perspective via not altogether buoyant verse ("The snapping turtle sometimes sees / the muddy deep, sometimes the trees, / and sometimes nothing but inside /the painted shell where it can hide"). Bursts of lyricism ("The water strider walks the shine / where air and water form a line") occasionally boost the impact of the text to the same level as the thoroughly striking art. Ages 4-7. What would you see if you sat at the edge of a pond and looked into the water? In this hand-size book, Anne Hunter illustrates in loving detail the creatures that live in and around a pond-a water strider, a tadpole, a red-winged blackbird, a painted turtle, and more. Each illustration is accompanied by simple yet detailed text describing the animal's characteristics and habits. 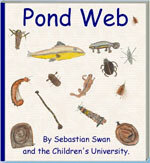 Young readers can put this book into a pocket or a backpack and take it with them to the pond. The artwork and simple sense of wonder will inspire children to explore their environment. Welcome to the River of Grass. Jane Yolen. Illustrated by Laura Regan. The magnificent illustrations and rich language make this volume of interest across the grades as the author depicts a day in the Everglades. The lush river of grass�inches deep and miles wide�is home to a wide variety of interesting residents, both flora and fauna. Predator/prey relationships are depicted. Written by Melvin Berger. Illustrated by Megan Lloyd. In Look Out for Turtles! readers will discover why these creatures have survived so long. Hard shells protect many turtles from harm. Colorful markings on their shells help some turtles to blend in with their surroundings. Different kinds of turtles can live almost anywhere on land or sea and can eat many kinds of plants and animals...Today turtles must struggle to. survive. They are hunted, and threatened by pollution. There is less and less open space for turtles to live in. If turtles are going to be around for another 200 million years, they are going to need our help! 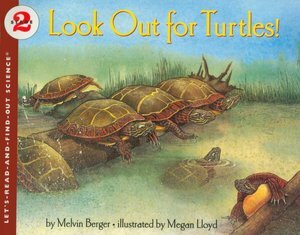 A day in the life of a box turtle is rendered carefully in words and lifelike illustrations with a text that respects its subject, avoids any anthropomorphism, and is simple enough for very young listeners. It records the turtle's actions as, slowly but with perseverance, he drinks, searches for food, evades danger, and sleeps. The outstanding gouache paintings in borderless, horizontal two-page spreads are so realistic that one almost reaches out to feel the turtle's textured shell. Although at times the turtle seems to be camouflaged, blending into his surroundings, he stands out clearly once located. The animals he encounters are equally well illustrated--readers will almost hold their breath so as not to frighten the raccoon and chipmunk. The book's design is excellent; even the well-chosen type, superimposed on the illustrations so that there is no visual break from the scenes, is clear and easily read. This is superior nature study for young readers and listeners. Written and illustrated by Gordon Morrison. Hardcover, 32pages. Reading level, ages 4-8. 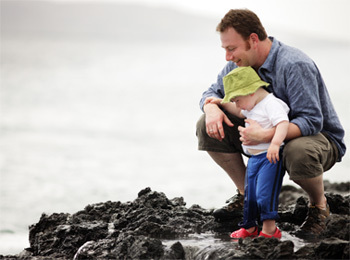 Changes and activities that occur over days and weeks throughout the seasons in, on, and around a pond are described. Through the narrative and illustrations the reader observes interactions of thriving plants and animals. Insets provide additional details about these plants and animals, the seasons, and how a pond is formed. SQUISHY, MISTY, DAMP & MUDDY: THE IN-BETWEEN WORLD OF WETLANDS. Molly Cone. Sierra Club. Paperback, 32 pages. Reading level, ages 4-8. Stunning, well-placed photographs pull the reader into this book. 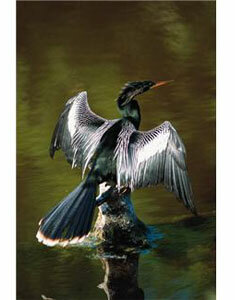 The story here is diversity--of wetlands and the abundant life they support. It also speaks of their precarious future and the importance of preservation. Cone's richly innovative text is enhanced by touches of alliteration and an almost poetic cadence. 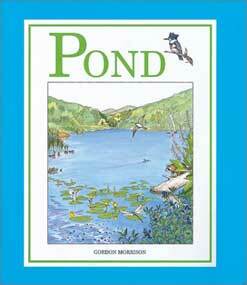 Assorted pond-themed printable activity sheets for ages 3-6. The publication measures 8.5X11 in. The full 15 pages may be printed to create a master, which can then be copied back to back. The reverse of the "contents" page is blank. 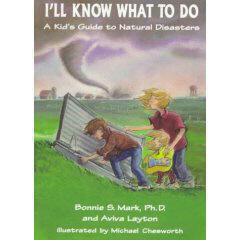 The booklet serves educational needs for Grades K-5. It addresses: What is a wetland? 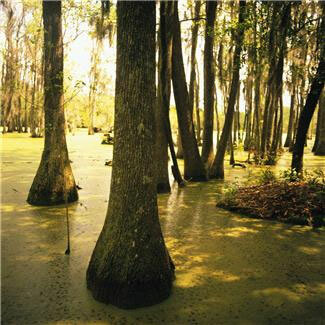 ; Wetland plants; Wetland animals; Wetland types (marsh, swamp, floodplain, etc. ); Visiting a wetland; and Value of wetlands. Goes perfectly with their excellent full color fact sheets. 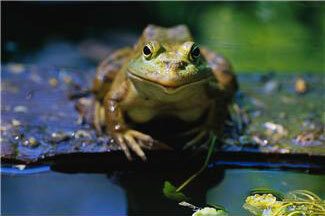 Includes some other amphibians native to British Columbia, Canada as well. Printable pages from the U. S. Fish and Wildlife Service that introduce several basic concepts about wetlands and their importance. 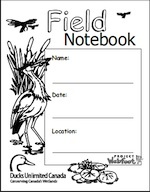 Wonderful printable journal worksheets for use with wetlands field trips for older kids. 15 pages. Courtesy of Project Webfoot and Ducks Unlimited of Canada. Could easily be used for other regions.